If you’re a healthcare provider or payer looking to invest in AI for better patient care at lower costs, this is a webinar you cannot afford to miss! For nearly a decade, everyone has been talking about Healthcare AI, without really a sense of where to begin. That ends now! 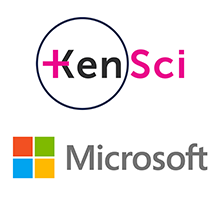 Having successfully cracked the formula together, KenSci and Microsoft are sharing four true cases of health systems that have invested in AI and witnessed success with as much as 4X ROI in as little as 12 weeks. Hear from two leading experts in the industry on how they have helped health systems commence their AI journey, make better use of their existing data, and steer their organization towards true north and a visible win. You don’t just have to take our word for it, at the end of the webinar we’ll share the secret on how you can mark your success in healthcare AI by saving a million patient lives, and at least a million dollars. • Success stories of AI implementation; population health management, disease risk prediction, drug cost spending prediction and more. • Why getting started on your AI journey doesn’t take lot: just 3 simple steps. • What to expect from your AI implementation. ROI in 90 days, six months and 1 year. • Why betting big on AI is the next best move for your health system. Clifford Goldsmith brings a unique experience to Microsoft as a physician who also has over 33 years of know-how envisioning, designing, developing, and selling high-performance solutions for the healthcare industry. He has been with Microsoft’s Healthcare team for more than 18 years and in his current role of National Director, he designs, develops and executes Microsoft’s strategy for the US Healthcare Provider Industry. Dr. Goldsmith has focused on numerous areas of healthcare information technology including accountable care organizations and patient centered medical homes, healthcare AI, Genomics, pharmaceutical clinical trials, medical devices and embedded systems, agents for home care and patient engagement. He has also served as Chief Medical Officer of Aptima Corporation, where he led a team in transitioning well-tested concepts on human-centered engineering from aviation and the military into healthcare. Prior to joining Microsoft in 1998, Dr. Goldsmith worked for Harvard University’s Department of Medicine and the Center for Clinical Computing, developing and managing various aspects of the EHR for both Beth Israel and Brigham and Women’s Hospitals. During this appointment, he pioneered full, remote access electrocardiograph (ECG) integration with the EHR. He founded and managed LINK Medical which delivered a commercial product that integrated ECGs and other waveform diagnostics into the EHR. He joined the HL7 (Health Level 7) Committee in its early years and collaborated on both the Order Entry and Results Reporting standards. Dr. Goldsmith received a B.S. and a M.B.B.Ch (MD) from the University of Witwatersrand, South Africa. As the Chief Growth Officer at KenSci, Sunny leads all Marketing, Partnership and Sales/Business Development functions. Sunny has held leadership roles at Aditi Technologies, (now Harman Connected Services), where he led worldwide marketing and alliances. He was pivotal in driving awareness, building the Aditi brand, and sharing the story of their unique service culture. Prior to Aditi, he held various roles at Cognizant. Sunny possesses a Bachelor’s degree in Computer Science and Engineering from Visvesvaraya Technological University and an MBA in Marketing from IIM-Bangalore. He is an avid reader, painting enthusiast and art follower.